South Bay homeless advocates call it "The Wall." 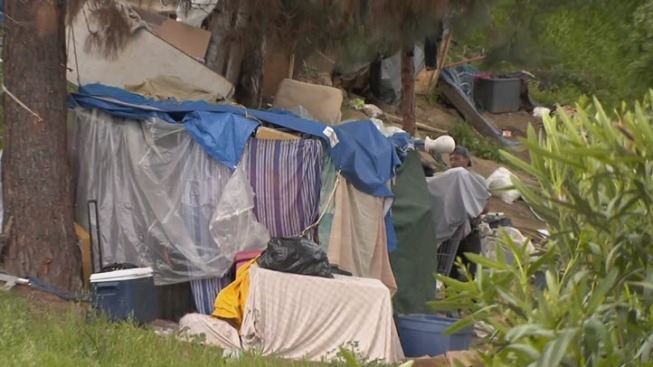 Caltrans and San Jose have started a project to fence off what was one of the area's largest homeless encampments with a barrier workers say can't be cut or climbed. Hundreds of people previously lived off Macredes Court under an Interstate 280 overpass even after the city conducted sweeps to remove them. Homeless people who have lived in the area have been warned by crews the fence being installed cannot be penetrated. Homeless advocates, including non-profit In Their Shoes, said they are sympathetic to the neighborhood concerns acknowledging there were incidents of violence and drug use. But they also call the fence The Wall, saying to them it symbolizes an attitude. Advocates also said The Wall strategy just pushes homeless into neighborhoods. Some residents said they are worried homeless people may now move into their areas. Caltrans is expected to section off a large area around the old encampment site, but no one knows how effective it will be until The Wall is up.